"I went to Susan with several different health issues, mainly sinus and menopausal related. She took a thorough medical history and made me my first 'brew'. I found within a month that I had improvement, and after discussing areas that still needed work, Susan adjusted my herbs further. We now confer on a regular basis and the herbs, adjusted as my needs change, have made a remarkable difference in my quality of life. 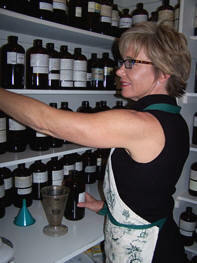 I highly recommend Susan's gentle expertise as well as her extensive herbal knowledge." Susan has offered Health Coaching to those who would like to learn about the wise use of food, herbs and appropriate lifestyle choices for healing since she first opened her practice in 1996. Though it is her belief that we are blessed to have surgery and pharmaceuticals available for the most extreme health problems, Susan remains passionate about helping those in search of less-invasive solutions. Though Susan rarely takes on new clients, given her involvement with teaching, writing and volunteering with both Steamboat Springs Courtesy Ski Patrol and Yampatika, she has been dedicated to offering many health solutions through her writing. If you don't have one already, order a copy of Susan's first book Take Back Your Body. Here, you will find tons of inexpensive solutions for your health problems. And stay tuned via Susan's blog and e-newsletter for a new series of e-booklets downloadable on Amazon. There is list below of various ailments which can be alleviated, completely or in part, by the wise use of herbal remedies. Yet equally as important is learning how to make mostly wise choices regarding whole foods, regular and varied exercise, plenty of rest and water, and doing what it takes for you to de-stress. *Symptoms of menopause include hot flashes, irregular periods, flooding/excessive bleeding, irritability, insomnia, migraines/headaches, fatigue.